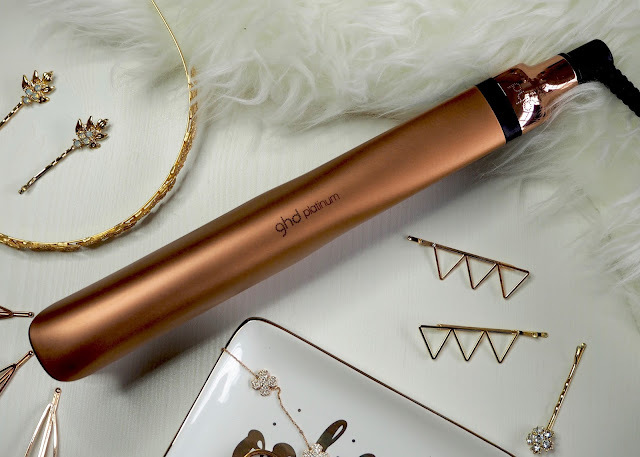 I've used ghds for ages and would never be without a pair, but there's something extra special about the new Copper Luxe Platinum Styler - it's rose gold! 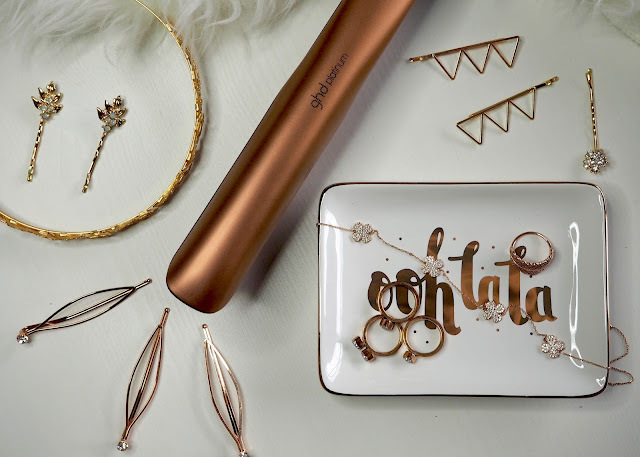 I know everyone and their dog is into rose gold these days, but that doesn't put me off - I'll literally buy rose gold anything and everything, so owning rose gold ghds is a must! As well as being beautiful to look at, the Platinum Styler has clever tri-zone technology to achieve 50% less hair breakage as well as increasing shine by 20%. 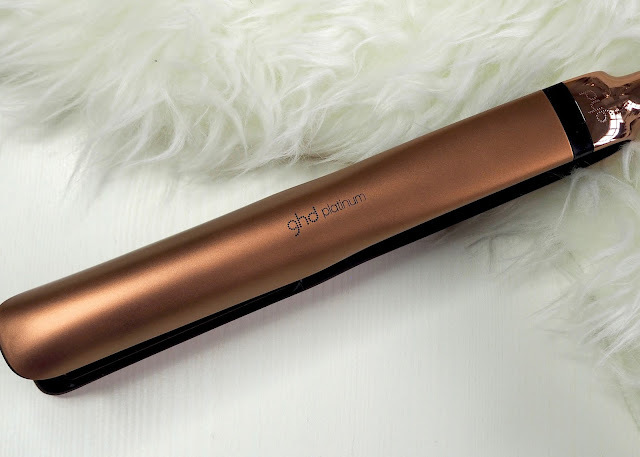 The Platinum Styler also comes gift boxed with a heat proof travel / storage bag and two limited edition Nails Inc polishes in copper shades, because you've got to coordinate your nails with your ghds, obvs! I love curling my hair with ghds, it's quick and easy and the curls last really well. I used to try all manner of wands and curlers on my hair - it took much longer and was extra fiddly, and I found the curls would drop so quickly. My hair responds much better to curling with ghds because of the high heat, so it's the only way I curl my hair now. Since I've had some balyage colour I much prefer wearing my hair wavy as it shows of the different shades better, and with ghds I can get my whole head done in about ten minutes flat! So, super festive ghds at the ready, here's how I created my New Year's do. After blowdrying my hair smooth until completely dry, I added some more heat protectant spray and brushed through. Next I sectioned my hair into four - one top and one bottom section on each side of my head. I then worked from the back of my head forward, using the ghds to create curls on one inch sections at a time. If you've not tried curling your hair with a flat iron before, it's really easy and works on a similar basis to when you curl scissors with ribbon! 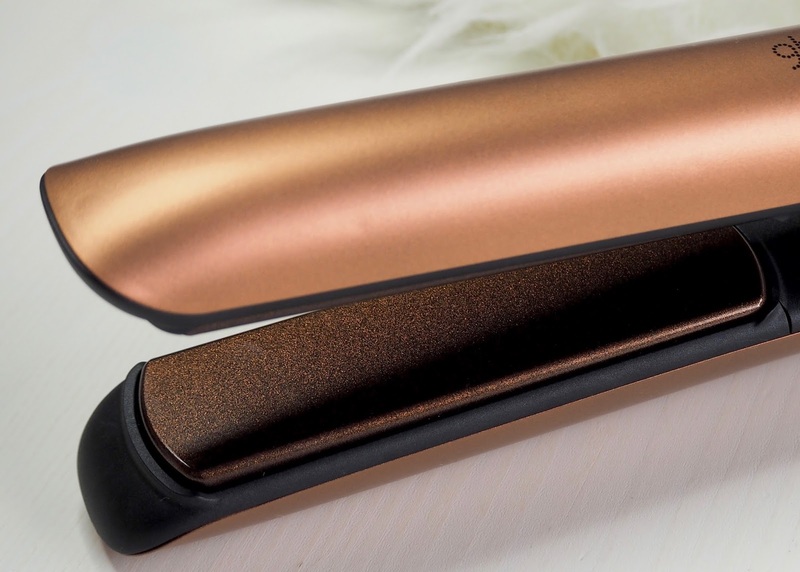 The curved edges of the ghds make curling even easier - all I do is take a section of hair, clamp it between the plates and then pull down through my hair whilst rotating it away from my face. It creates a gorgeous, bouncy curl every time, and by angling the styler downwards, it gives me more of a loose wave effect which I love. The smaller the sections you take, the more defined your curls will be, so I find taking a thicker section looks softer and more modern. 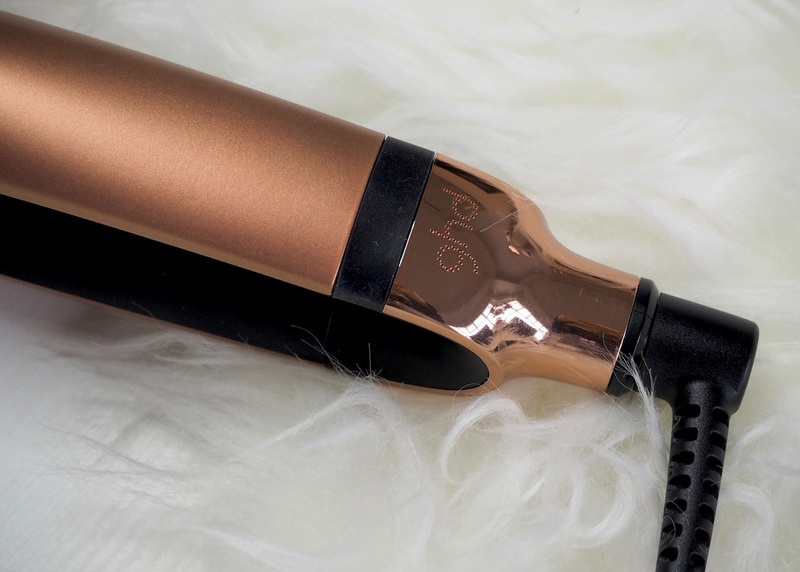 How quickly you move the styler through the hair changes the curl you get too - the more slowly you pull through the hair, the longer the hair has in contact with the plate and the curler the result will be. I tend to move through the hair quite quickly to get that loose, undone sort of curl. Another tip I like is to put fewer curls into the bottom / underneath sections of my hair - by starting curling nearer the ends - so that I don't end up with too much volume near my face. Then with the top sections I start the curl higher, just below ear level. Oh and I always curl away from my face too. 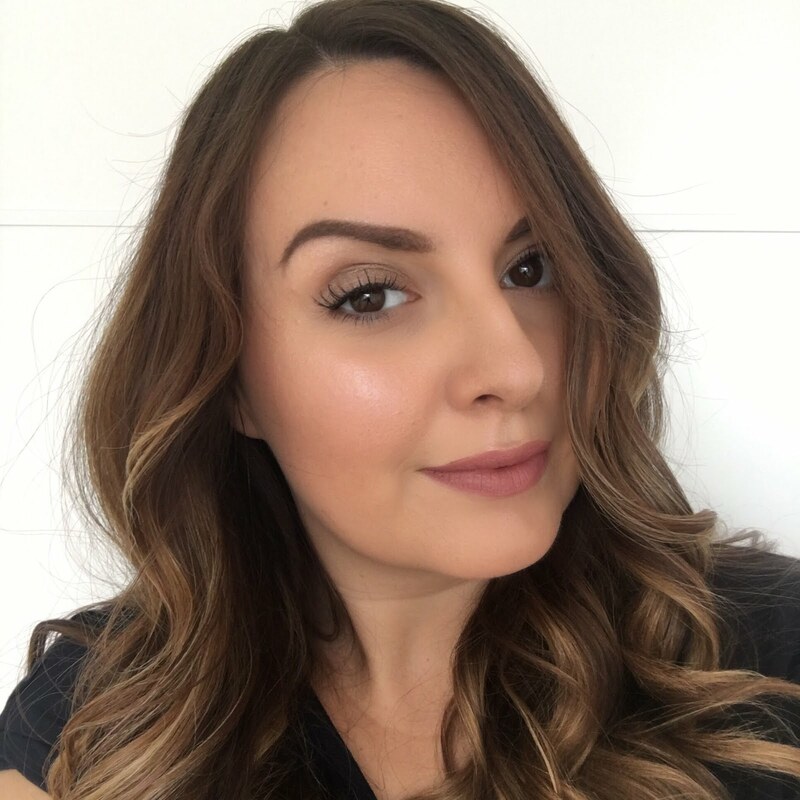 Once all of my hair was curled, I brushed the waves out a bit to make them a little looser and more flattering, and then added a little ghd final shine spray to help tame any flyaways and add a glossy finish. 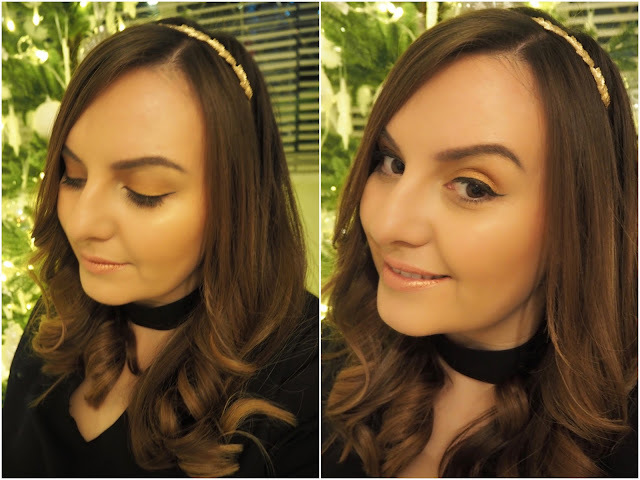 As it's the season of all things glitzy and glam I finished the look by adding this really pretty headband from Accessorize - I think it completes the look nicely. I even wore some rose gold makeup because I was inspired by the beautiful Copper colour of the ghds! If you're on instagram you may have seen that ghd have been running a competition throughout the festive season to win ghd Christmas gifts. Winners are being picked every Saturday until 7 January, so there's still plenty of time to get involved. To enter the competition all you need to do is follow @ghdhair and share a photo or video of your festive hair do complete with metallic accessories or embellishments using the hashtag #glitztheseason. 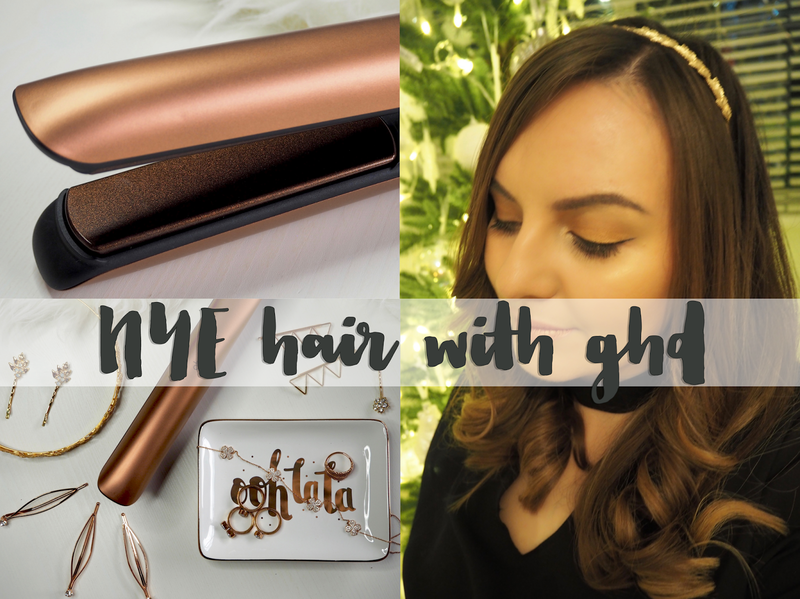 I think I'm going to be snoozing partying at home this New Year's Eve, but I have a fun family day and dinner planned for New Year's Day, so I'll be rocking my embellished ghd waves for that. Happy New Year!